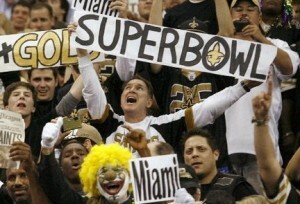 The Saints winning the Super Bowl was one of the good sports moments of 2010. 2010 has been an interesting year in the world of sports. As is typically the case, there have been some wonderful and memorable moments, but also some that we all wish could be erased from the memory banks. From the time the Saints entered the NFL in 1967 the franchise seemed to spend more time on the blooper reels than in the highlight films. It took 20 years before they posted a winning season and another 13 years before claiming their first playoff victory. When Hurricane Katrina hit the region in 2005 there were some who believed that New Orleans could no longer support an NFL franchise. Yet, when the Superdome reopened in 2006 the people of New Orleans completely embraced their team and the players did the same for the city. They reached the NFC Championship Game that year, but lost to the Bears and over the next two seasons slipped back into mediocrity and out of the national conscious. 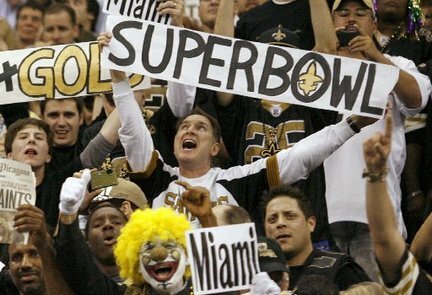 After posting an 8-8 season in 2008 there was little expectation that the Saints would be a serious championship contender during the 2009 campaign. However, under the direction of quarterback Drew Brees the Saints came out firing on all cylinders and reeled off 13 straight victories to start the season and earn homefield advantage throughout the NFL playoffs. The Connecticut women's basketball team raised their winning streak to 89 games with a dominating victory over Florida State. Much has been made of the Connecticut women’s basketball team passing the 1971-74 UCLA men’s basketball squad for the longest winning streak in college basketball history. It is truly an amazing accomplishment and one that should be celebrated and given significant publicity. However, instead of simply recognizing the greatness of coach Geno Auriemma and the Connecticut program, many (including Auriemma himself) can’t get away from the gender issues related to this being women’s basketball. Some former UCLA players, sensitive to the legacy of their beloved coach John Wooden, said in advance that they hoped UConn would lose. Other have been quick to assert that since this is women’s basketball, UConn hasn’t been challenged every night the way I guess they think UCLA was. While I can understand the first reaction by UCLA players, it reminds me of the members of the 1972 Miami Dolphins who crack open a bottle of champagne every year once all NFL teams have lost a game. 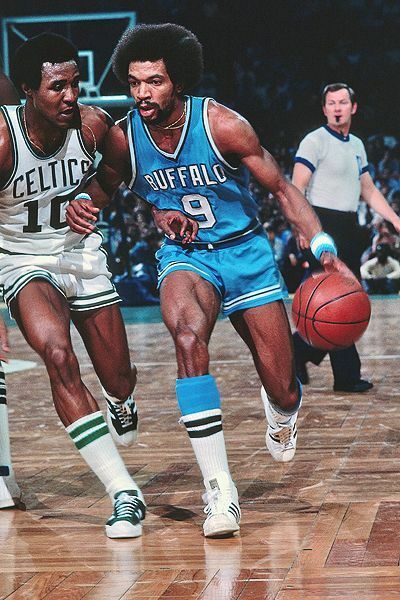 Much like the 1972 Dolphins, the legacy of Coach Wooden’s Bruins is secure and not in doubt just because another team has broken one of their records. 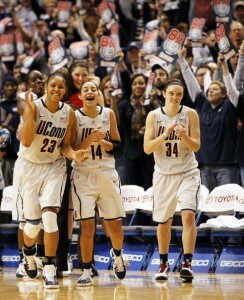 Maya Moore and the UConn women's basketball team has towered over their competition for the last two years. According to the old saying, the only things certain in life are death and taxes. It might be time to modify that phrase to make it death, taxes and a dominating victory by the Connecticut women’s basketball team. The Huskies didn’t just defeat West Virginia to win their 72nd straight victory; they annihilated the eighth ranked team in the country 60-32 to claim their 16th Big East title. The old adage of “on any given night” just doesn’t seem to apply to the Huskies as they have taken the game to a new level. 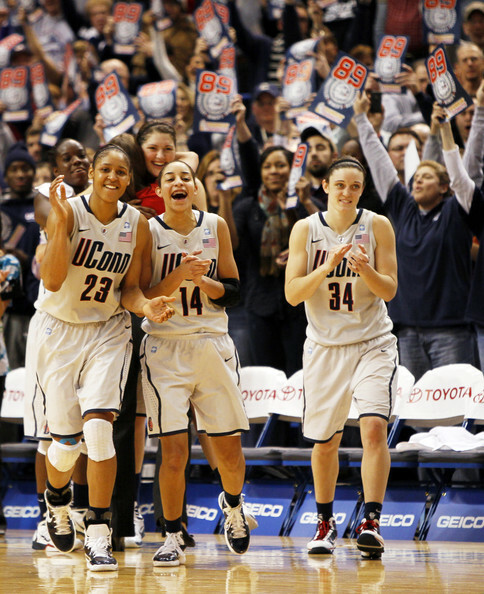 Since the start of the 2008 season, the Huskies have been playing in a different stratosphere than all other teams in women’s college basketball. The Huskies did not eclipse their own women’s basketball record for consecutive victories by posting a bunch of late game comebacks and last second victories.